Legal director in the Ministry of Transport and Infrastructural Development Angeline Karonga and suspended Civil Aviation Authority of Zimbabwe (CAAZ) chief executive officer David Chawota yesterday appeared in court on allegations of awarding a company they owned a tender to supply bitumen to the Zimbabwe National Roads Administration (Zinara) before sharing US$1 234 004.72. The pair formed a company called Akodac Consultancy Services in 2009 which was then awarded a tender in the same ministry which Karinga is a director. 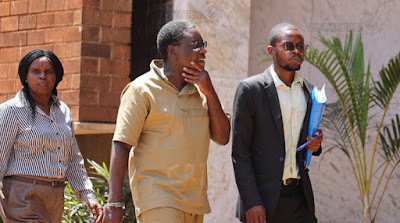 The two appeared in court facing charges of corruptly concealing from a principal a personal interest in a transaction when they appeared before Harare magistrate Mrs Learnmore Mapiye. The prosecutor, Mr Desire Chidanire, opposed bail and asked the court to roll over the matter to April 1. He said the investigating officer in the matter failed to attend court due to illness. In response, the pair’s lawyer Mr Tinofara Hove told the court that some of the investigating officers had attended court and the prosecution must lead them as witnesses on why bail is being opposed. Mr Chidanire told the court that the officers that were in attendance were not part of the investigating team and were not privy to the investigations. Mrs Mapiye gave Mr Hove a chance to lead Mrs Karonga on why she was a proper candidate for bail. Mrs Karonga told the court that she was a responsible parent and a person of fixed abode. She further stated that she would abide by any conditions given to her by the court and that she would not flee trial as she owned valuable assets in the country. Mrs Mapiye said the court can only grant bail after all the accused persons had made their submissions. She deferred the matter to April 1 for continuation of the bail application. It is alleged that in January, 2012 the accused persons’ company made an application to the State Procurement Board (SPB) to be on the approved list of suppliers of bulk and drummed bitumen so as to participate in Government tenders. The accuseds’ company went on to register with ZINARA, a public entity under the MOTID as a supplier of bitumen. The company went on to carry out transactions for supply of catmix and stable 60 which are products of the manufacturer of bitumen on 24 occasions from February 2 2012 up to August 18 2013.